The entryway in our house is really more of a landing. 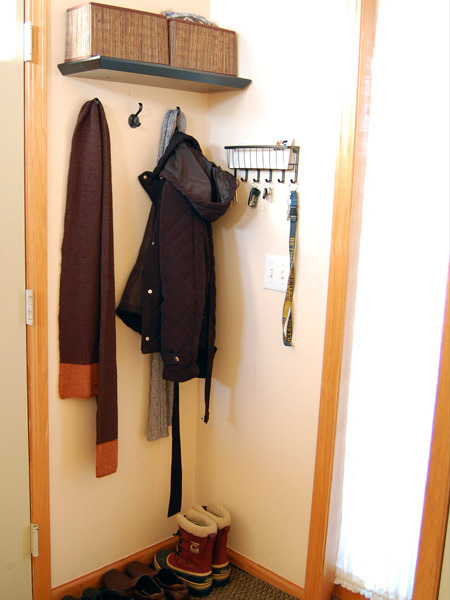 When we moved in, it had a coat rack that looked like a board with inserted dowels, hung at about waist level. It served as a place to put car keys and jackets; periodically one could even find mail precariously balanced on top of the dowel mess. The problem with this wall is it's only 25" or so wide. And on this wall, I want to store shoes, keys, mail, coats, and other winter accessories. Neatly. Sadly, every organizational unit I found was too large. How to solve such a dilemma? Go modular! For more ideas, check out the Gussy Sews Inspiration Workshop. This week's theme is "organization." Cute! 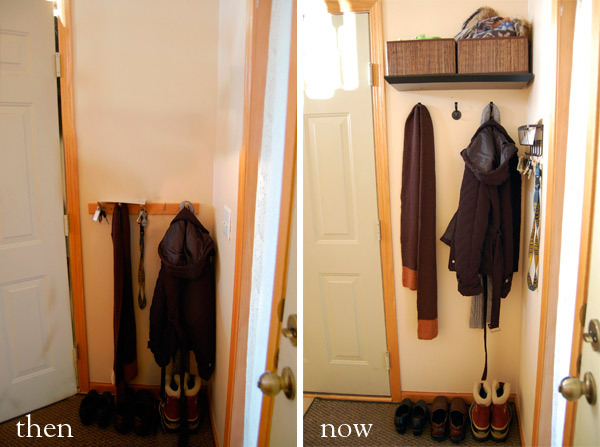 I love this little entryway makeover. =) I want to do something for our entryway soon too, it's so tiny but I think I could make better use of the space somehow! With your creativity, I have no doubts that you'll figure out a solution!